We've been promising to bring ADQ to the web and soon we will - with the help of people just like you. Since the Car Wars pages got updated and we posted a call for volunteers, we've had pretty good response. We're now in the coordination stage and I've set up a ADQ HTMLization Project page so everyone participating can see what's been converted and what's currently in the works. We can still use volunteers, so dig out your ADQ issues, fire up the scanner, and go! But please check the ADQ Project page before you start. Other than that, it's been a slow news day. No word on the elves. >Long-shot Lola might be a bit too much. Maybe not. In other news, it was discovered today that the elves (otherwise known as ''those damned elves'' had garbled the GURPS Vehicles, 2nd Edition playtest files, fiendishly disguising WordPerfect files as innocent ASCII text files. This problem has been corrected, but it leads us to believe that the elves were much less benevolent that we were originally led to believe. In addition to the phone calls, it has also been learned that the elves had made ''a large number'' of photocopies during their occupation of our offices. The police are continuing their search for the elves and have been interviewing neighbors, searching for a possible witness to their misdeeds. Notice anything different? While we were happily stuffing our face full of turkey and cranberry sauce, elves snuck into our offices and gave the website a facelift. Just look what they did to the Car Wars page!. And while they didn't quite finish the job, they did manage to post the playtest files for GURPS Egypt and GURPS Krishna, both due out late next year. It also appears the elves cleaned out the office refrigerator of its stock of orange juice, took every last packet of artificial sweetener from next to the coffee machine and made over $2500 in long-distance phone calls. The authorities have been contacted and we will bring you more information as it is made known to us. Which also happens to be the title of an Assassins card, but if you think I am going to tell you what it does or what its frequency is, you are a raving optimist. The point is just that we're back at work; the INWO plug was completely gratuitous. We got a note today from Steffan O'Sullivan, mourning the fact that Star Traders is so unappreciated. Well, it is; it's a good game, and we don't even have a page for it yet. We will, someday; we want to offer what support we can for even the out-of-print things. But in the meantime, Steffan has written a brief article about it. And, apropos of nothing, I stayed up entirely too late last night reading Grunts, a novel by Mary Gentle. It was published in the UK - I don't know if it ever made it over here. Imagine orcs with machine-guns, in a fantasy world that isn't entirely ready for the innovation. Sick, brutal, disgusting, funny. I liked it. Vacation's over . . .
Hope yours was as good as mine. I caught up on some reading (and writing) and even goofed off a bit. Don't tell, OK? I also did a bit of web-surfing. Here's a really obnoxious page for you vampire fans. And I updated my own home page a bit, with links to some new sites I like. This Web stuff is fun . . .
Our offices are closed today and tomorrow for Thanksgiving. Have fun, enjoy your own vacations, and don't eat too much turkey. And no matter where you are in cyberspace, look at the MIT Hack Gallery to check out the fun they've been having. You may have noticed a few changes around the SJGames website lately. In the coming weeks, you'll see a lot more both in terms of style and content. Hi, I'm Bob Apthorpe (aka <webmaster@sjgames.com>), the new WebMaster for SJGames. I've spent the last few weeks getting familiar with our site and answering questions. Recent accomplishments include the new INWO Assassins page as well as several GURPS worldbook pages. Prior to joining Steve Jackson Games, I was an analyst with the Safety and Engineering Analysis group at River Bend Station, a nuclear plant just north of Baton Rouge, Louisiana. I've been a gamer since 1982 and have been programming professionally and recreationally since then as well. But, as they say, past is prologue. My goal is to build and run a first-class website - first-class in gamer support, first-class in product information, and first-class in entertainment value. How this will be done (as well as the meaning of the term 'entertainment value') will be revealed in due time. Suffice it to say, the weirdness has just begun - who knows where it will end. Well, PhilCon is over, and I had a great time. They make an effort not to overload their guests with panels . . . but there was so much going on, I still couldn't see it all. The other featured guests were Jack Williamson, Connie Willis and artist Bob Eggleton (who has done a GURPS cover or two in his time, and who just keeps getting better). Plus about 2,000 assorted fans, pros and who-knows-what. Good dealers' room (lots of books for sale!) - a big LARP - just generally lots of stuff to do. Of course, another reason I had such a great time is that Assassins was finally at the printers, rather than hanging over my head like a pasteboard Sword of Damocles. I had black-and-white proofs of all the new cards to show off, and it was a lot of fun watching people read them and ooh, ahh, laugh out loud and occasionally shout in dismay. The INWO tournament went very well, too. I let everyone add up to five Assassins cards per deck, using blank cards and copying from the proof sheets. That was evil, and everybody liked it, so Claudia will do the same thing this upcoming weekend at the INWO event she runs at the Dallas Fantasy Fair. The finals ended in a shared victory. I won't give the names (Be paranoid. You may be playing against them next con.) but Zurich achieved his Basic Goal and then declined to claim victory, knowing that someone was holding an Upheaval card that would take him down again. So he just knocked. A few minutes later, the UFOs unmasked themselves as Hermes and played a Goal card, turning a wimpy seven-card power structure with the Crystal Skull into a win that couldn't be broken by the Upheaval. So that card never got played, and Zurich shared the win. Sneaky, sneaky. Oh, yes. Thanks to the Web-hacking talents of Bob Apthorpe and the graphic skills of Jeff Koke, we can now bring you . . . the Assassins page. Read it and tremble. I'm in Philadelphia this weekend, Gaming GoH at PhilCon. This is a big, old convention - it's their 59th year - but they are keeping up with the times. Case in point; I'm posting this at 12:30 am from their Internet room. There are about a dozen terminals with telnet and gopher access to the Net . . . you just sit down and log in. Nice, nice, very nice. Tomorrow I'll run an INWO demonstration, and Sunday we'll have a tournament. This will be fun. The players don't know it yet, but they're going to get to use Assassins cards. Not real ones, of course - those don't exit yet - but official fakes, made up from blank cards and the complete, final set of proofs that I brought with me. But that's tomorrow. Right now it's time to dance. Well, it's a countdown for me, because I've got all of next week off. Hope the weather's a bit better, though -- today it's gray, drizzly and about 55 degrees. Definitely not golf weather . . .
Steve will be back next week, though. He's currently in Philadelphia (as is Convention Liason Becca Bross), enjoying the hospitality of PhilCon, where he is Guest of Honor. 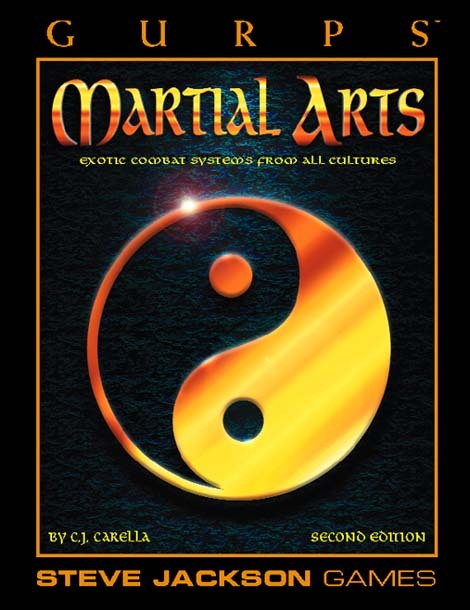 In other news, it looks like GURPS Martial Arts, 2nd Edition will go to the printer tomorrow, just in time to be a January release. 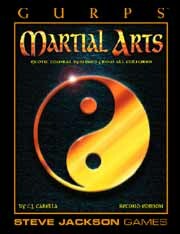 This is a big book, with 160 pages and a lot of material added in from GURPS Martial Arts Adventures and elsewhere. Our new Webmaster is starting to pay off -- we've got playtest files of a new manuscript up on the Web, thanks to Bob. Check out the GURPS Alternate Earths home page for a sneak peek. And we'll have some more books up and available in the very near future, including the latest draft of GURPS Vehicles, 2nd Edition. 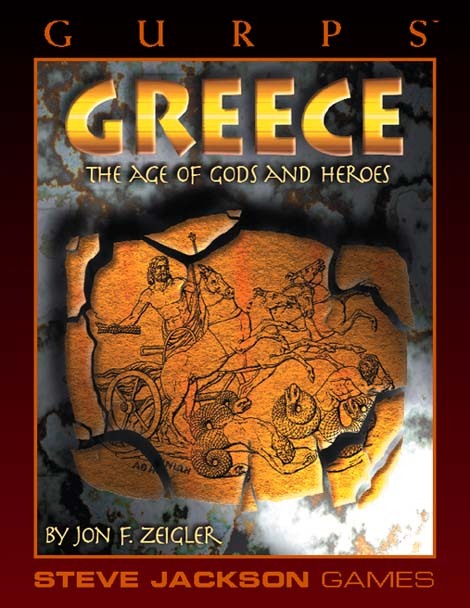 And hitting the stores any day now is GURPS Greece, which I'm mentioning here mainly because we've never put the cover up on the Daily Illuminator . . . until now. That's right. It was a year ago today that the very first entry in the Daily Illuminator appeared on this web page. An awful lot has happened in the past year here at Steve Jackson Games, most of it very, very good, and we owe it all to our fans on the net and everywhere. Thanks. By the way, if you want to see that first Illuminator (which wasn't even what we called it then), you can read it (and the whole run, if you want a day-by-day look at company history) simply by clicking on the Past columns link here or at the top of the column. The First Taste's Free . . . The last of INWO Assassins went to the printer today, thanks to hard work by our graphic wizards extraordinaire, Jeff Koke and Derek Pearcy, the diligent proofreading of Print Buyer Monica Stephens and plenty of help from everyone else. Thanks. 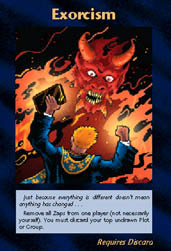 Just to whet your appetite, here's a look at one of the cards that will be available soon. How soon? We've got our printer in high gear now, and we're hoping that we'll have Assassins in the stores just before Christmas. Ho Ho Ho! Back to the salt mines tomorrow. Tonight, we take a deep breath and relax . . . I played the new Society of Assassins Illuminati group in last night's INWO Assassins playtest against Steve Jackson's Network, Claudia Smith's Cthulhu and Bob Apthorpe's Bavaria. Of course, I won. But to be fair, I must admit I got lucky. After screwing up a potential game-winning attack, I realized that my only hope was to draw a New World Order card that would push several of my groups into "doubler" range. I had two precious action tokens left -- and I knew it wouldn't be enough to defend my power structure against the next round of counter-attacks. So I spent the tokens and drew from my plot deck, hoping that the one card I needed (out of the 15 or so that remained) was on the top. And like Mel Gibson in ``Maverick,'' I drew the card. I owe it all to clean living and that sleight-of-hand course I took in community college . . .
We played with a number of new cards last night, including the Society of Assassins Illuminati, of course. Vladimir Zhironovsky made an appearance, the End of the World ushered in a New World Order that was good for Fanatics and Churches and bad for Governments and Corporations, and the Servants of Cthulhu became a Registered Trademark. We're playing again tonight. More tomorrow . . .
Work on INWO Assassins is moving along very nicely, thank you. Art is being finalized, arcane phrasings of card text is being furiously debated, proofreading continues without let-up, and we've got a few more in-house playtests to run, too -- including tonight. I'll post some results, and a few more teasers (maybe a piece of art? Who knows what the Secret Masters will allow?) and official release information, tomorrow. Tonight, the conspiracy awaits . . .
Today's weird acronym is used to announce a new web page in the SJ Games family. The INWO VFAQ is a Very Frequently Asked Questions file for INWO -- that's Illuminati: New World Order for those of you who don't know. Anyway, the VFAQ covers those questions that are asked so often that they get lost in our longer, more traditional FAQ. If you have any INWO rules questions (or you're just getting started), this is the first place you should look. My place in history is assured. I'm on a game card. Two game cards, actually. They're part of the new expansion for Ultimate Combat, from Ultimate Games. One is "Alter Destiny," and the other is "Betrayal." Very Illuminated. They flew me to California a few months ago for the photo shoot. We had a great time. Unfortunately, they wouldn't let me keep the batch of fifties that I'm waving in Don's face in "Betrayal." Are we having fun yet? I sure am! I just got back from an interesting event: a mixer, sponsored by EFF-Austin, at the HTCIA meeting here in Austin. That stands for High-Tech Crime Investigation Association. Very interesting folks! The idea was to meet some people, build some bridges, and exchange some viewpoints. Looked like a success to me. Bruce Sterling was in fine form, as always. "You'll have to deal with us in Austin. Or people just like us. They ship busloads in every semester." But the best thing of all was the great big glaring "Cyber Cop 95" button that one of the high-tech Javerts gave me. I won't try to describe the cartoon. Suffice it to say that a career in law enforcement clearly doesn't take ALL the Elvis out of you. Back and Not Dead or Anything! That was one heck of a couple of weeks. The Essen trade show was huge and busy. Gaelcon in Dublin was more fun than people should be allowed to have. More about both of those events later. Perhaps most important, from my point of view, I seem to have avoided the Irish Flu this time. (But it gets a card in INWO Assassins). Oh, yes. "How is Assassins coming? ", you ask. And I can finally answer without a raise in blood pressure. Sitting for a couple of hours a day in a German hotel room, with a computer, lots of space to stack papers, and no life whatsoever, was what it took to break the block. So when will it come out? With luck, before the end of the year. They're rolling right along on the last pieces of art, and the cracked INWO playtest team is doing their best to break the last few cards. A lot depends on how fast the printers can do their thing, and they've got a leg up; the card stock was bought a LONG time ago, and the booster pack wrappers (which are the part that take longest) are already printed. So we'll see. The World-Wide Web is growing faster than anyone ever imagined. When we first put SJ Games on the web over a year ago, we figured we were out there on the cutting edge. But the rest of the world seems to have caught up, and now that the ``big boys'' have come to play, we need to step up to the challenge. So we now have a full-time Webmaster. He started this week, and his name is Bob Apthorpe. He's getting a feel for how we do things around here, and then he'll dive into the rather daunting task of keeping our web pages up-to-date, all while expanding and improving them, too. If you have any comments about our web pages, you can send them to Bob at <webmaster@sjgames.com>. 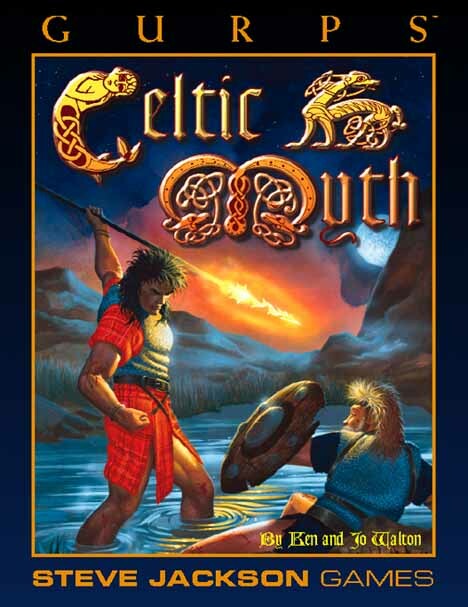 Oh, we got GURPS Celtic Myth off to the printer last night -- many thanks to Susan Pinsonneault, Lillian Butler, Jeff Koke and Monica Stephens for a yeoman's effort on a late, rainy Halloween night. 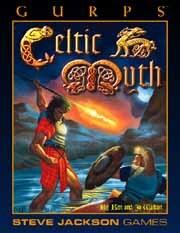 Look for GURPS Celtic Myth in December. A couple of other quick notes: Steve Jackson returns tonight from his European adventure. I'll get him to tell all about it as soon as he's recovered enough to do it. And for those of you that have missed recent installments of the Daily Illuminator, you can always click on the Past columns link at the top of the page to check them out.